I’ve been dabbling in making a lot of fantasy type faces lately. [This actually started back in December.] And I have really enjoyed the process. The process that I have been so frustrated with however … costuming. I have decided that I can never be a doll maker because I don’t like fashioning the clothes for the dolls. Faces, definitely … clothes, not so much. My hat is off to all of you who make things from fabrics, as this is one thing that most definitely eludes me.So, help me out if you will …. what should I do with all these little fantasy heads I’m enjoying making? Leave your thoughts in the comments below. Oh how I love Ancient Egypt and it’s rich history. You can read all about my little tin shrine here. These little eye screws are perfect for clay. You get 700 in the pack and they come with free shipping if you have Amazon Prime. Don’t miss this deal. I’ve never seen these before for this great of a price of $6.99. CLICK HERE to get them now. 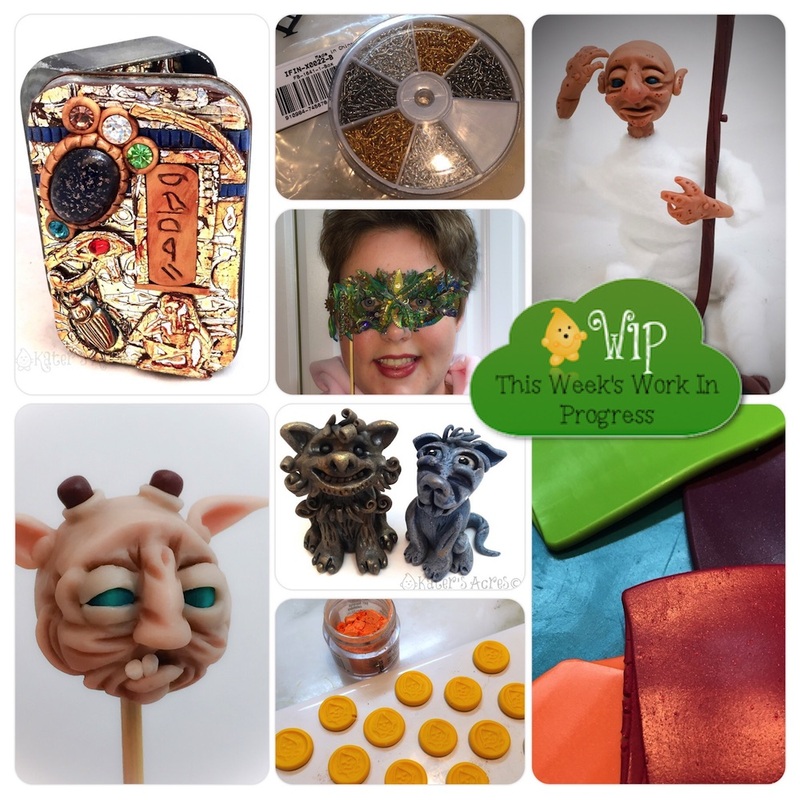 Are you working on your polymer clay mask yet? Here’s me wearing my JunglePunk mask. The first challenge is on for Parker’s Clay Tribe … to make your own mask! You can read all about the challenge and how to enter here. I showed off Cypress the Wood Elf on my FaceBook page late last week. Now you can see him at his full size. But without costuming … why? Read the description above. This color palette was one I absolutely LOVED this past week. This color palette was used to make this Crystallized Peacock that you can make yourself with this tutorial. Who doesn’t need a dog guardian or dog gargoyle. I’d like a whole pack of them, after all, someone needs to watch over my coffee stash! You can learn to make your own here and even enter to win one of these two here. Last but not least, this is my newest face sculpt. It’s a fantasy ogre, who needs a name and his paint details yet. Online communities are a LOT of fun. Parker is hard at work gathering new clay enthusiasts and has opened up his own clay group: Parker’s Clay Tribe. It’s a FREE group for anyone who plays with clay on FaceBook. We have swap, challenges, prizes, and even giveaways. Anyone is welcome to join. Parker’s Clay Tribe is sponsored by Parker’s Clayful Tutorials Club. Consider becoming a member and learn to make your own whimsical creations. Katie, could you share where you got the base for your mask? I can’t seem to find any paper mache ones to cover. Hi Krithika, I didn’t use a base for my mask. I just freehand cut the shape. When I baked it, I propped it with skewers, wooden thread bobbins, and foil to give it its shape. Sorry I couldn’t be of more help. Thanks Katie! I could never cut free hand so neatly. But I dug around and found a mask shaped cutter in my cutter stash! Totally meant to be!! I’m experimenting this weekend with the cutter.